Cult debuts tonight on The CW at 9 p.m. Eastern. Its pilot episode, “You’re Next,” is currently streaming on Hulu. Television’s creative resurgence has contributed much to the pop-culture canon, but it’s also stifled one of the idiot box’s loudest and most-dependable critics: The anti-TV musical screed. Apparently the tradeoff for getting more Mad Mens and Parks And Recreations is losing new successors to “Television, The Drug Of The Nation” and “TV Party.” Good riddance to “shaking the American sheeple from their test-pattern stupor” hectoring, I say. (Have you listened to “She Watch Channel Zero? !” lately? It totally stalls the second side of It Takes A Nation Of Millions To Hold Us Back.) Sure, the TV industry still churns out a lot of garbage on an annual basis; yes, the average American probably spends more time in front of the tube than is good for his or her wellbeing. There a lot more diamonds among the broadcast-and-cable rough than there once were—in “TV Party” terms, today’s equivalents to Hill Street Blues have fewer That’s Incredibles to contend with—and that makes it tougher to hyperbolically decry the anesthetizing effect of the ol’ television set. Television’s place in the cultural hierarchy has changed, altering the viewer’s relationship to the medium along with it. That takes a lot of the implicit threat out of television—film satires along the lines of Network or the more outwardly comedic likes of Stay Tuned are also a dying breed. Maybe that’s because TV does a much better job at jabbing those fingers at itself, as The Daily Show and The Soup attest on a nightly and weekly basis. While eschewing a comedic tact—and turning its eye toward what’s happening offscreen in 21st century TV Land—The CW’s Cult picks up where those works left off and makes a valiant effort of repeating your mother’s warnings about sitting too close to the TV. Of course, suggesting that Cult is secretly an admonishment of contemporary television is giving the show too much credit. Its pilot episode, “You’re Next,” sits more comfortably with scholcky “TV Party” selections like Quincy, M.E. and Vega$. It’s a spectacular failure, but a spectacular failure with ambition, one that tries to tie decades of intense TV fandom into a high-concept conspiracy thriller that neither speaks honestly or intriguingly to notions of fandom nor sets up a conspiracy that’s worth unraveling—or all that original. Premièring in the wake of The Following, the show-within-a-show novelty of Cult won’t be enough to make viewers flock to another series about a charismatic leader maliciously pulling the strings of an untold number of puppets. In fact, that novel approach is destined to place all sorts of barriers around Cult—and right at the moment when its network could use a series that a large number of people watch live in order to pick at its intricacies in real time alongside fellow fans. (But as most analysts will tell you, that simply isn’t how The CW’s target audience watches TV. 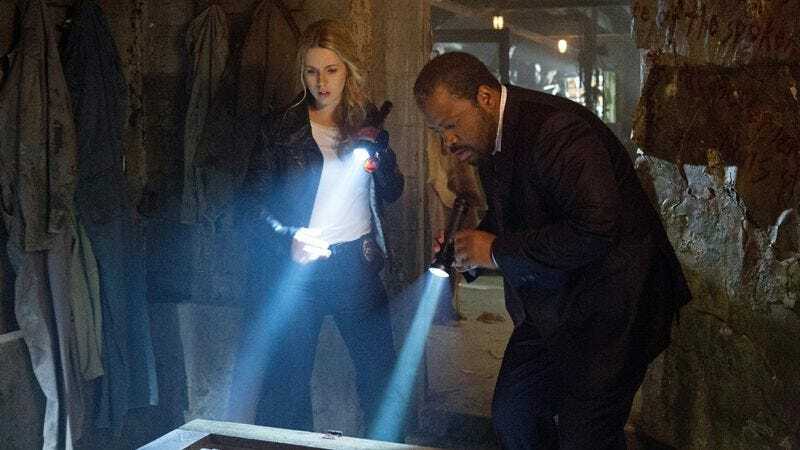 Hence the tagline “TV now.”) Here’s how it goes: Within the world of Cult, The CW broadcasts a much-loved, little-watched program called Cult, in which Alona Tal (Supernatural, Veronica Mars) and Kadeem Hardison (Dwayne Wayne!) investigate crimes seemingly tied to a religious sect—a sect of which Tal’s character was once a member. So engaging is the show and its myriad mysteries that its most devoted fans gather at dimly lit Internet café’s to scrawl cryptically in notebooks and assemble conspiracy corkboards. When one such fan goes missing following some strange behavior and a garbled phone call, that fan’s brother, Jeff (Matthew Davis), uses the investigative know-how honed in his past life as Washington Post reporter to get to the bottom of this whole Cult phenomenon. Still with me? It’s an awful lot to digest in a single hour, so it’s a credit to creator Rockne O’Bannion (Farscape, V) and the show’s army of executive producers (which includes CW ur-showrunners Josh Schwartz and Stephanie Savage) that the jumps between the reality and fiction of Cult are the one facet of the show that works right away. Naturally, both the “real” world and the show-within-the-show have the glossy, high-cheekboned look of CW programming. However, scenes with Jeff and the Scully to his Mulder, Skye (Jessica Lucas), favor a cooler color palette, while Tal’s scenes with fictional (or is he?) cult leader Billy Grimm (Robert Knepper) are speckled with oranges and reds. Like the similar conceit put forth in another not-long-for-this-world, high-concept mystery that debuted at midseason—Kyle Killen’s Awake—this makes the moments when Cult’s two worlds start to bleed together truly pop. If only every other aspect of Cult weren’t so thuddingly stupid. Within “You’re Next,” there’s the kernel of an entertaining thriller that heightens TV fandom to outright fanaticism. There are also glimmers of a humorously self-reflexive look at the business of making television, as channeled through the smarmy confidence of the network exec who plans to make the show-within-a-show a legitimate hit. But if future episodes are as alternately coy and blunt about what Cult is driving its fans to do, frustration will soon overwhelm the sugary buzz of watching a show so utterly committed to its own nonsense. The breadcrumbs leading to the second episode are the tantalizing lack of details doled out in “You’re Next”—but that strands all of the activities of the Cult cult in a narrative with zero context. The fans (and possibly some people connected directly to the show) are involved in some shady dealings—but to what end? What’s achieved by pulling Jeff’s brother into this web? And why, if the show inspires such devotion, do the cosplaying members of the fictional Cult’s fandom only take on the costuming of two characters? And for a show so fixated on mystery, Cult sure has a bad habit of showing its hand in the dialogue. Of course Jeff lost his job at the Post because of an unethical decision; of course Skye joins him on this wild good chase because she knows “what it’s like to have someone you love go missing.” Cult requires so much suspension of disbelief to begin with—no need for such ham-fisted justifications so early on. It is best to keep the “real world” characters talking, however, because when they’re not, they’re watching Cult, which presents the show with its biggest visual and narrative hurdles. Even when laced with a Spielbergian gravity, the multiple scenes of Jeff gazing at a TV screen trip up “You’re Next”—probably because a TV, no matter what ill effects it’s having on the viewer, is nowhere near as terrifying or awe-inspiring as an offscreen dinosaur or flying saucer. Matthew Davis is no Laura Dern in that regard, and the blankness of his TV-watching could serve as an ideal illustration of “Television, The Drug Of A Nation”’s central thesis. The episode hiccups every time he pauses to look for clues hidden on his brother’s DVR; a smoother method of transitioning into Tal and Hardison’s adventures—or simply showing Jeff turn on the TV and jumping straight into the show-within-the-show—would make for an improved Cult. The best thing that the première of Cult has going for it is also the type of thing that would strike fear into the heart of Michael Franti circa 1992: This trifling little pill gives off an entertaining, potentially addictive high. The pilot manages to pack a few surprises, and exhibits an admirable conviction in the face of its most telegraphed twists. It’s dumb, but never dull, and while the show-within-the-show conceit could lead to Billy Grimm swallowing his own tail, it’s powered by enough batshit to warrant follow-up viewing. Of the three shows that ushered in this winter’s Season of The Cape—the other two being Do No Harm and Zero Hour—Cult has the most potential to become a Harper’s Island/Happy Town-style distraction, a capital “F” fiasco whose eyes are too big for its stomach. Its pilot is an epically flawed first chapter of a serialized thriller—but hey, at least it’s not Channel Zero.